Queen Cersei Lannister is the widow of King Robert Baratheon and Queen of the Seven Kingdoms. She is the daughter of Lord Tywin Lannister, twin sister of Jaime Lannister. This Cersei, Game of Thrones Costume is just one version of a Daenerys Outfit that we have in stock at Dallas Vintage Shop. Choose from many versions of all of your favorite Game of Thrones Characters for the CON of THRONES Event in Dallas. Here are a few Costume Categories where you will find EVERYTHING YOU NEED to assemble Exceptional Con of Thrones Costumes that you will be proud of. Just remember that the thousands of images you see on this site are only a tiny fraction of our encyclopedic inventory. Con of Thrones Time & Dates: Starts May 25th at 10 am and goes to 27, 2018. NOTE: If you are TRAVELING TO DALLAS for Con of Thrones you may want to arrive a day or two early in order to visit Dallas Vintage Shop and pick-up Game of Throne Attire or Costume Pieces & Accessories to Update or Upgrade your GOT Character’s Outfit. 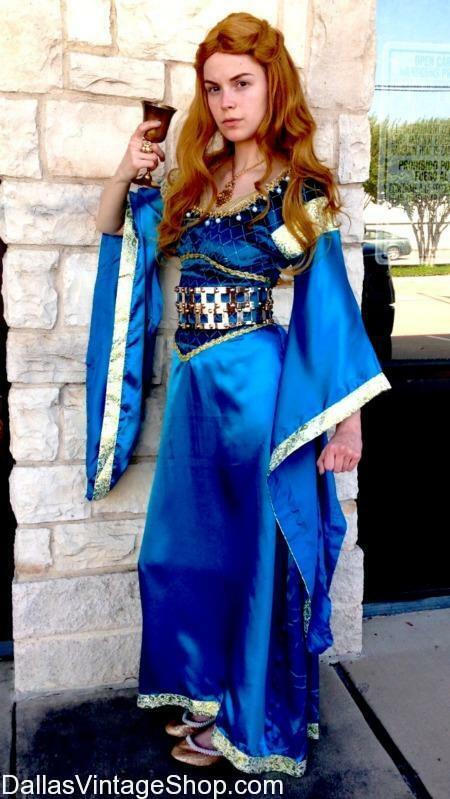 See more Con of Thrones Costumes from Dallas Vintage Shop. See More Game of Thrones Costumes. This entry is filed under 2019 07/12-07/14 Con of Thrones. You can follow any responses to this entry through the RSS 2.0 feed. Both comments and pings are currently closed.